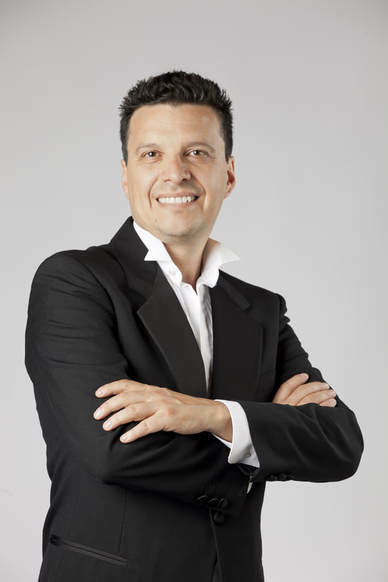 Colombian-born Canadian, Carlos Bastidas, is Artistic Director and Principal Conductor of the Ontario Pops Orchestra and Music Director of the Durham Chamber Orchestra. Since founding the Ontario Pops in 2014 he has led it from its inaugural concert in 2015 to its fourth sold-out season in 2018-19. As Music Director of the Durham Chamber Orchestra since 2016 he has been such a contributor to the orchestra’s success that they have had to change venues to accommodate their increased audiences. He has worked with many leading Canadian ensembles and enjoys close collaborations with the Etobicoke Centennial Choir, Ave Choir Toronto, Durham Girls' Choir, The Young Singers, The Taylor Dance Centre in Ajax, and the Swansea School of Dance in Toronto, among others. His conducting appearances include Open Doors Toronto, Classical 96.3 FM, and the official opening of the “Canada 150” Celebrations at the Ajax City Hall. ​A highlight of last season was the “Canada 150” anniversary celebration performance of Popular Canadian Classics, sponsored by the Toronto Symphony Orchestra and the Government of Canada. Bastidas conducted the combined musicians of the Ontario Pops Orchestra and the Durham Chamber Orchestra with special guest Canadian Juno-nominated vocalist Heather Brambrick. Bastidas also conducted the intricate and beautiful Beethoven’s Emperor Piano Concerto, Sarasate’s Concerto for Violin and Orchestra, Tchaikovsky’s Nutcracker suite, Sibelius’ Finlandia, Beethoven’s Symphony 7, the Overture to Carmen by Bizet, the William Tell Overture by Rossini, and the Overture to Ruslan and Ludmilla by Glinka. Upcoming projects for 2018/2019 will be conducting the performance of the Vivaldi Bassoon Concerto in E major with soloist Nadina Jackson, a former Montreal Symphony Orchestra bassoonist, Peter and the Wolfe in multimedia with live actors and orchestra as well as conducting the Canadian premiers of “Vortex”, by Italian Composer Mauricio Nasi, “Peggy’s Medicine”, by Canadian composer Paul Alexander and "Journey Through the Ice Cavern" by Canadian composer Alex Sandoval. Bastidas studied bassoon, composition, conducting and chamber music at the University of Ottawa before going on to study orchestral conducting at England’s Sherborne School of Music. His honours include, playing as section bassoonist with National Arts Centre Orchestra of Canada (1996) and the Vancouver Symphony Orchestra (2001).